Not the best pictures, but Warlady asked me about the sizes of various anthropomorphic animals, because I've been working on Burrows and Badgers. Here's a Reaper mousling with an Oathsworn mouse. The Oathsworn is a little chunky, but the mousling is even more exaggerated. I'm not sure that I'd mix them. They are similar in height, though. I have two Darksword Critter Kingdom figures. 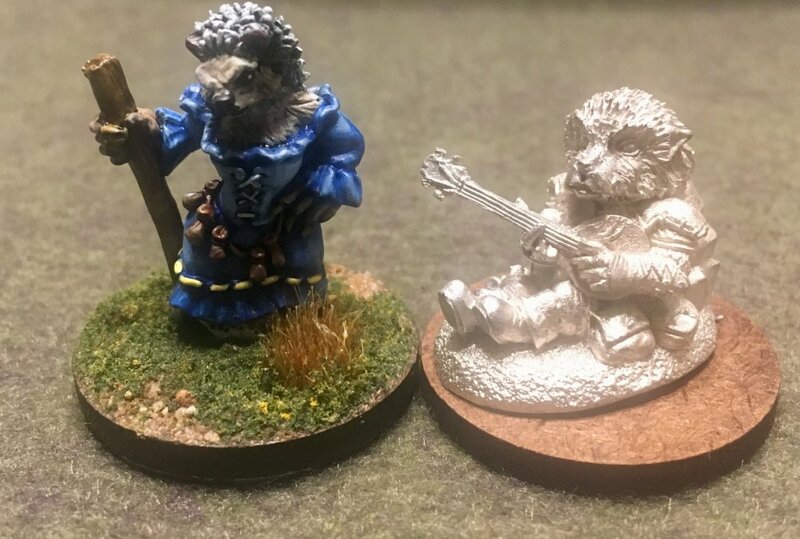 This hedgehog bard is also exaggerated compared to the Oathsworn, but possibly in a reasonable range for size. My other Darksword figure is a penguin rogue, so I know he won't fit in. All of the Darksword figures are approximately the same size, so if you can live with the mix of styles, it looks like B&B "medium" sized beasts (e.g. hedgehogs, squirrels, weasels) would be the best bet for compatibility. If anyone else has additional pictures, please post! Thanks for the comparison. It's very helpful! So, a very long time ago, somewhere around the turn of the millennia, when I started buying minis (not counting that dragon I bought in the early 90s...which I should get around to painting one of these days....) I came across a miniature that would change the course of history! Well, my history anyway, because if I hadn't seen it I likely wouldn't be posting about all these other minis I bought because if it, not to mention all the butterfly bunny effects that that one change would have made to the timeline....but I digress. One that faithful day I spotted the legendary (and apparently back in print!!) Doom Bunny from Ral Partha. I, of course, had to have it. It then sat (as is usual) unpainted for years. Then one day, while GMing a campaign, I decided to run an entire rabbit themed night as we were playing on Easter Monday. The campaign either had (I think, unless this was the first animal night....I think the Bovine Liberation Army came first....) , or ended up having an animal theme for a bit so all was good. I painted up the Doom Bunny and my wife painted up 4 Reaper bunnies from some familiar set or another (must have been one with weasels in it, I needed a bunch of those for a Hackmaster thing). I had a very fun time running the bunnies (unlike the BLA final encounter...anyone remember how long it took to create a high level minotaur blackguard in 3.x? It got critted 3 times in the first round and went down in the second. It got to act once and rolled a 2 or something....but I'm not bitter....) and since that time have gone out of my way to collect rabbit figures of all sorts. So, long story, er, long, it's time to start thinking about painting the rest. A big motivation for this is that I recently went in on a Killer Rabbits kickstarter and have a horde more coming soon. The other motivator to get going was Reaper releasing 03929: Drangus, Duckman Warrior, the hereditary enemy of bunnies everywhere! So step one was to find them. I spent a good hour digging through boxes and I "think" I found them all (excluding any painted exchange figures I may have received due to mentioning in EVERY survey I've done for years). So at the front we have the 4 Reaper bunnies and the Doom Bunny. The grey resin is Bombshell, as are their little doom bunny and jackelope (it still counts!) sidekicks. The right side are all Darksword. The left in front are Oathsworn. 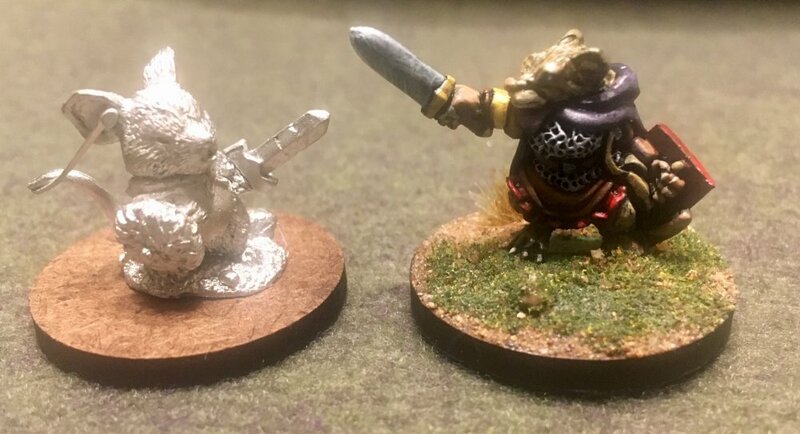 Back left there are 6 spear bunnies that I believe were Ral Partha from the same era as the Doom Bunny (they have the same shields). And at the back is Nibbles, from CMoN's Arcadia Quest, which a friend ordered for me with their KS order. BTW, if you know of any other bunny figs, feel free to mention them here, or PM me directly if you prefer. I'm always on the lookout for more. Up next will be bagging all the multipart figs now that I've got them sorted, then figuring out what to start with. That may not be a quick process, but I'll (theoretically) get there. Also speed practice, so this was 45 minutes on the timer. I’ll post more once I get the basing done, which may not be until Friday.